As we move into winter, we need to prepare our older horses to maintain their health and condition through winter to come into spring in a healthy way. This preparation requires to combine both nutrition and management, especially if we have a fussy eater. To assess what condition our older horse is in, we need to assess its condition score and weight. There are numerous condition score charts online with example pictures to assist you in determining what condition score your horse is, one example can be found at www.barastochorse.com.au We want our horse going into winter in good to the moderately fleshy condition if they are healthy and in light to moderate activity. For an older thoroughbred it is generally easier to reduce their weight than to gain weight and condition. Protection from the elements is important for older horses. The wind and rain we get in Australia can require up to 10-20% of additional energy trying to keep themselves warm. Some simple solutions are to provide shelter away from wind and rain as well as waterproof rugs. Remember if you do rug your horse make sure you regularly check their condition and that the rugs are not rubbing them. Horses are herd animals; some horses will ‘fret’ when separated from the herd. They will commonly lose their appetite and not consume enough feed to maintain their condition. If you have such a horse make sure they are in a paddock with a friend or has another horse in the adjoining paddock. Ensuring your horse's teeth are in good shape is also important coming into winter as the correct chewing of feed initiates the digestive process. 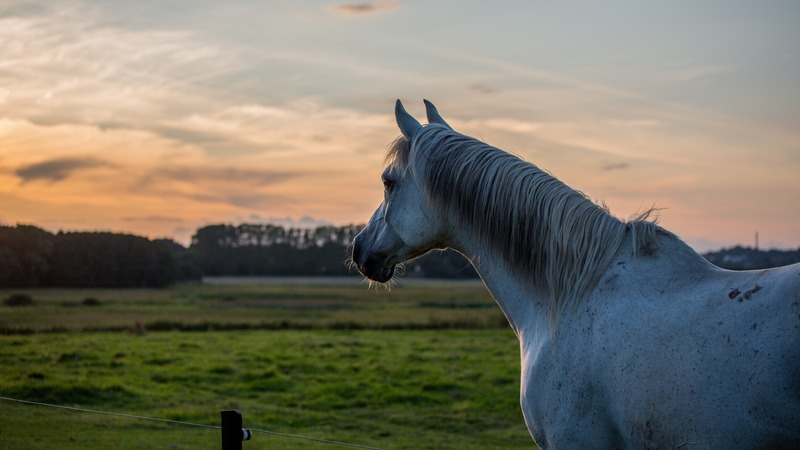 If a horse does not chew feed correctly because of poor dentition, it may result in reduced intake, digestibility and as a result a drop in condition. Also when the dentists are looking at your horses’ mouth, they may find ulcers or problem teeth that may affect your horses desire to want to consume their feed. Feeding a horse during winter in which it is a fussy eater can be quite frustrating. When the weather turns, a horses thirst and appetite will decrease resulting in less feed and water being consumed which can result in a drop of condition but also can increase the risk of colic-related symptoms. If you are currently feeding your horse, continue to monitor your horse’s condition and adjust your horse’s diet accordingly. Consult your nutritionist to ensure your diet is maintained. If you generally are not feeding your horse and are relying on pasture/hay as a majority of your horses feed intake, I would suggest finding a suitable feed prior to the onset of winter such as Barastoc Senior. If they are a fussy eater perhaps try a few different feeds to find the one most palatable to your horse. This may mean trying pellets like Barastoc Senior or a sweet feed such as Barastoc Completo. When selecting this feed to make sure you are supplying a balanced ration. Don’t feed a feed at 1kg per day when the feed is to be designed to be fed to a high-performance horse at 6kg per day. Trying different roughage sources such a grass / oaten or Lucerne hay may be worth considering. If an older horse has poor dentition, I would suggest softer hay which is also a more digestible fibre source. If you make it half way through winter and your horse does not want to eat all or enough feed, there are some tricks to try. Molasses is a sweetener and whilst too much sugar is not ideal a small amount mixed with warm water and mixed through their feed will improve the palatability. There are also some natural extracts such as gamma oryzanol extracted from rice bran that has been shown to increase appetite in your horse. When considering some of these natural products, please ensure they are compliant with the relevant authorities if you are competing with your horse over winter. Moreover, finally, to increase your horses’ calorie intake without increasing the size of their feed too much, I would suggest adding a vegetable-based oil such as canola oil. Vegetable oils are quite energy dense as an example 1 cup of oil can be of a similar energy level of 1kg of oats.